Matt Lomaka loves playing his saxophone. The young lad who also suffers from Down’s Syndrome practises every day and really enjoys playing the notoriously tricky instrument. When his grandpa sadly passed away, Lomaka took the opportunity to honor him in the best way possible. 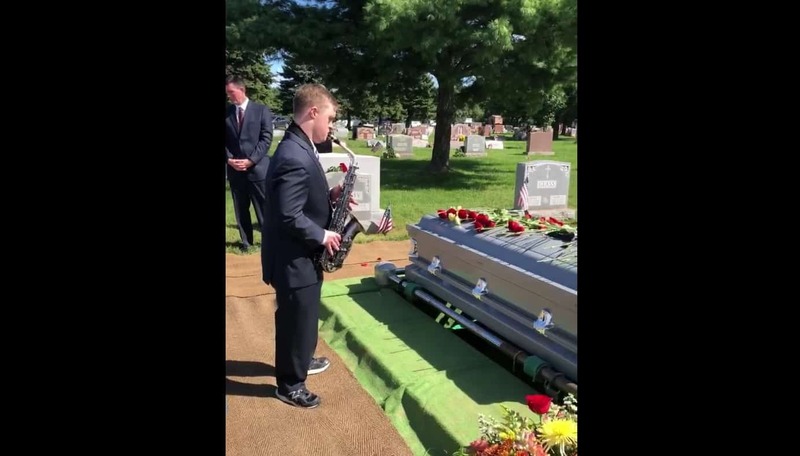 He paid a loving tribute to his grandfather, who he called “G”. His performance touched people at the funeral, who shed a few tears. Lomaka has lived his whole life with Down’s Syndrome, a genetic disorder which often affects learning and growth. However, he has put hard work and effort into learning and practising the saxophone, with spectacular results. Lomaka has come through life’s barriers to play this emotional performance in tribute to his grandpa. He proved that anyone can do something if they put their mind to it, and above all is an inspiration to us all. Let us know your thoughts on Matt’s wonderful saxophone performance, and what he’s overcome to get to where he is today. Don’t forget to share this story with your friends and family, and check out similar stories on Happiest. Check the original post on Facebook here.